The 2017 CFL season has arrived! The Argos host the ticats to kick it off this weekend. Jube has got you covered on the offseason & what to expect this week. While suffering thru Friday’s matchup between the Argos & Bombers, several fans voiced their displeasure with how the game had played out. This may be a bit of an exaggeration, but I’ve been witness to all of these situations at live sporting events throughout my life. And it’s confused me every single time. Let’s skip over the comments toward cheerleaders & fans (I don’t care what you say, those are never, ever appropriate) and talk about what’s directed toward players. I’m not a professional athlete. I wouldn’t describe myself as an athlete. Even when I played organized sports I never once referred to myself as an athlete. I won’t pretend to fully understand what it’s like to be paid to play and step onto the field in front of thousands in attendance and millions watching at home. I have, however, been around and participated in sport throughout my life, meaning I’ve been there when things are going well and when things are going bad. At no point in those struggling moments did I ever need the assistance of those in attendance to point out that things were going poorly. This is the heart of my confusion. Do fans that boo believe that the players don’t realize that they’re losing? 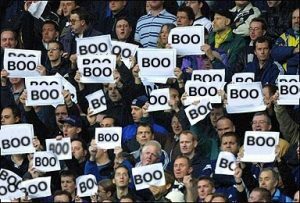 Do fans that boo believe their voice is a wakeup call to the players? Or is it something else? Is this vocal demonstration of disappointment more about the fans than the team? Is it more about fans venting their helpless frustration in that moment? My family and friends know me as a, “cup half full” kinda guy. I try to find the best of every situation. I carry that philosophy into my Argos games. Am I pissed that they’re losing? Absolutely! But why pile onto that negative? These pro athletes that have dedicated their lives to this sport understand the tempo and flow of this game better than we ever could, so they don’t need me booing to remind them that things gotta change. This is not me chastising passionate fans. Far from it! I love the energy in the building when it’s full and the fans are on their feet. But I do prefer the right kind of noise at the right time. Using Google Hangouts once again, we bring to you a quick 20ish minutes of post game chat following the 2014 Labour Day game between the Argos and Ti-Cats. The 2018 Season: Can It Be Salvaged? Lori on The 2018 Season: Can It Be Salvaged? Copyright © 2016 Argos End Zone. All Rights Reserved. The Section Formerly Known as 122/123.